Review The underlying packages in Linux Mint 17.2, just released, are largely unchanged. What you will find are a lot of improvements and added polish in everyday tools like the update manager, login screen and the Software Sources app. Sticking with the Ubuntu 14.04 base has given Linux Mint developers the opportunity to focus their time and effort on the aspects of Mint that make it unique. Much of that focus has been on the project's two desktops, Cinnamon and MATE. Indeed it's the updates to both desktops that make Linux Mint 17.2 well worth the upgrade. Mint seems to be one of the few distros to have taken the idea of "if it ain't broke, don't fix it" to heart, with the result that it’s fast becoming one of the most popular distros. 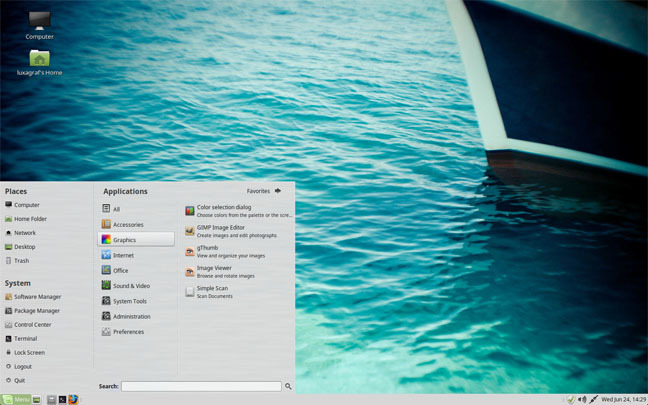 Part of the reason for that popularity lies in its excellent desktops, the stripped down, GNOME 2.x-inspired MATE, and the somewhat fancier – but still traditional – desktop, Cinnamon. Both of Mint's primary desktops stick with the traditional desktop paradigm – taskbar-like panels with applets, a start menu and system tray – making them popular with users not interested in "modern" desktops like Unity and GNOME Shell. Both Cinnamon and MATE have seen major updates in Mint 17.2. The Cinnamon version of Mint 17.2 ships with the brand-new Cinnamon 2.6 major update that builds on the previous release while adding improved support for dual monitors and better panels. It also sees some speed improvements that will make your desktop experience a bit snappier. In recent months Cinnamon has proved something more than just a Linux Mint desktop. It's now available in half a dozen distros and, while Mint is still the only distro to use it by default, Fedora and Debian have added Cinnamon to their installers. For a complete look at everything that's new in Cinnamon 2.6, see my earlier review. Cinnamon 2.6 in Mint 17.2 manages to offer a desktop experience that's both familiar and yet feels modern. 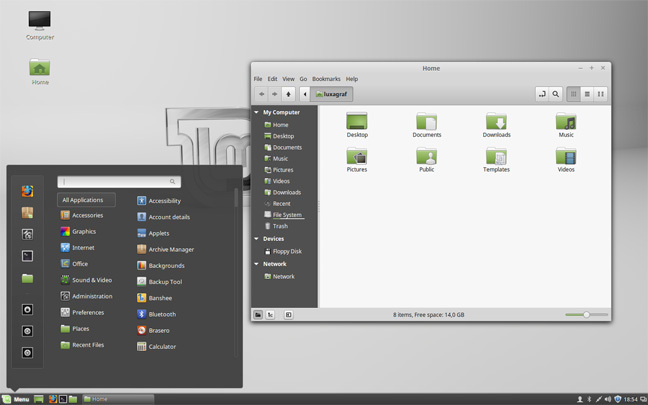 Linux Mint's other desktop, MATE, has also been the focus of numerous updates and improvements this time around. Mint 17.2 ships with MATE 1.10, which is notable for its speed and memory use improvements, most of which come out of a code analysis designed to track down and fix the problems. MATE has always been a lightweight, snappy desktop and I didn't notice much of a speed improvement, but it did use slightly less RAM in my tests. Another nice change is a new audio library by the name of libmatemixer. You might not notice it overtly, but it does mean MATE can now take full advantage of mixer functionality and will automatically detect and support PulseAudio, ALSA and OSS. MATE has a few other minor improvements, like the ability to enable or disable extensions in Caja (the default file manager in MATE) at runtime (no need to restart MATE for changes to take effect). The help and documentation tools are now available within the desktop and Linux Mint has started a "papercut" project for MATE designed to fix many small issues and port some of the Cinnamon new features into MATE. The results of that project should start to trickle in with point updates as the 17.2 release cycle progresses. There are also some improvements in this release to Mint-specific tools that are used in both desktops, like the Update Manager and Login Screen. Mint 17.2 continues to improve the already very nice, and surprisingly readable, Update Manager. This release adds support for package aliases, which means, for example, that a package like "muffin" can be displayed as "cinnamon-muffin" so it appears alongside other Cinnamon updates. This makes it easier to scan through your updates and see what's happening to various aspects of the system all in one spot. Even if you don't bother to read up on what "muffin" does, at least you know it's part of Cinnamon, and if the desktop suddenly starts acting wonky after an update you know where to start troubleshooting. There's also a new apt command available in this release, "apt recommends", which will show you all the missing recommended packages for a particular package. For example, if you want to install Calibre, you'd type "apt recommends calibre" to see what else you'll need to install. Another nice little change is the ability to hide the Update Manager system tray icon when no updates are available, if, perchance, this bothers you the way it did me. The related Software Sources configuration tool has a new feature that lets you open PPA archives and browse their packages. You no longer need to switch to another tool to install what you were looking for. Software Sources also now has a tool to list "foreign packages" and to downgrade them. What Mint refers to as a "foreign package" is a package where the origin or version is unknown and that doesn't match what is available in repositories known by your operation system. In other words you downloaded and installed something. It's now much easier to purge these packages from your system and to roll back to older versions. For example, if you enable Mint's testing repos to experiment with something and then change your mind, it's much easier to go back to what you had. While the base package system remains Ubuntu 14.04, there are some application updates – LibreOffice 4.4.3 and Inkscape .91. For more on what's new in the Inkscape update, see my full Inkscape review. One thing you won't find here is systemd, though your reprieve is short-lived since that will be coming when Mint updates to 16.04 as a base next year. There are numerous minor improvements to tools like the USB Writer, support for a larger number of HP printers, improved bash command completion and some improvements to the login manager. And, of course, Mint 17.2 features the usual slew of wallpaper updates. Mint has historically had a rocky upgrade process. It's almost always been easier to do a clean install of the system than to try to upgrade from, say, Mint 16 to 17. In Mint's defense, a clean install is always the safer way to upgrade a system – and another reason to have a separate partition for /home – but it did make upgrading a pain. Thankfully this is not the case with Mint 17.2 because the underlying packages from Ubuntu have not changed. You can update to Mint 17.2 directly from Update Manager. That will continue to be true for the rest of the 17.x release cycle (which will last through Ubuntu 16.04, due in April 2016).